We start seeing more patients with foot problems. Commonly this includes heel pain (which is often plantar fasciitis), forefoot pain which could range from stress fractures, neuroma pain, second MTP joint capsulitis, or even bunion pain. And a lot of this seems to flare-up when people are wearing flip-flops without any support, worse yet would be walking around on concrete barefoot. By the last month of summer, and sometimes into the fall we start seeing more patients who have suffered from these foot problems. This is because it so easy to slip on a pair of flip-flops and go to Costco. But places like Costco are a concrete jungle and you are walking on a hard concrete slab for half an hour or even an hour. This is very hard on your feet. Over the weeks and months, as summer progresses this can have a cumulative effect. And, it can be similar to an overuse injury than athlete would have from running or doing high impact aerobics. By the time patients come to our clinic for some of these problems, it can be significant enough that we have to do fairly aggressive treatments. Simple prevention can involve wearing good gym shoes instead of flip-flops when you are going to be on your feet a lot. Another option would be to wear very good sandals such as the vionic line of sandals. 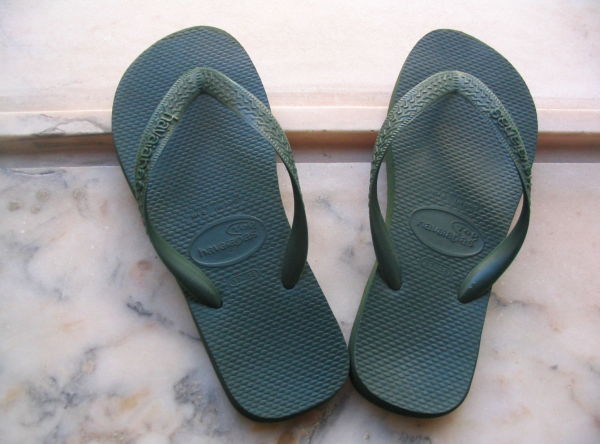 Some of these even look like flip-flops but they are not to have much more support. We have a number of different treatment options at our disposal for those people who ended up with this type of "overuse" flip-flop injury. Try to remember not go barefoot, instead wear supportive sandals like Vionic or gym shoes. Wear your flip-flops when you are at the swimming pool but not when you go to Costco!